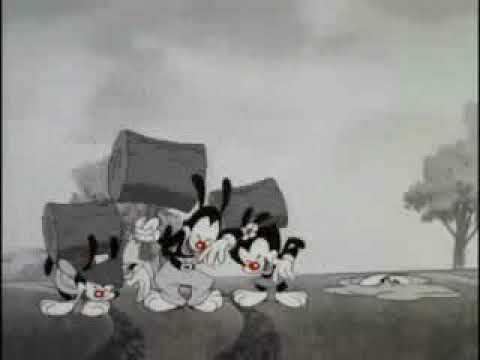 Animaniacs - We Smashed Buddy! What Warner says shes cute? Which of the Warners is your favorite? Can anyone name all of the Animaniacs characters? Try memorizing Dot Warner's full name! What are the Warner's species? Who's the cutest Warner sibling? I do not own Animaniacs. Animaniacs is copyright of Steven Spielberg, Warner Bros. and Amblin Entertainment. Hey, Aldrine2016 here. I present to toi a new Animaniacs fan fic. It's a bit short so who cares? Anyway, enjoy and comment! It was a typical day-off for the Warner Brothers (and the Warner sister!) in the water tower. Yakko was watching this bizarre, insane clip of a man with a banane in his ears (link) while his younger brother Wakko was listening to a hip-hop MP3 tune and burping musically at the same time. We start the fanfiction in a typical Looney Tunes "Rabbit Season, canard Season" cartoon. Daffy: [points Elmer's gun to Bugs] Rabbit season! Bugs: [points the gun to Daffy] canard season! Daffy: [points the gun to Bugs] Rabbit season! Bugs: [keeping the gun aimed at him] Rabbit season! Daffy: [aims Elmer's gun at himself] canard season! FIRE!!! As Yakko, Wakko and Dot were about to return to the studio, a fan of their montrer saw Dot's great flipped hairstyle and began to freak out with excitement. At first, Dot was confused, but since she was no longer being ridiculed for her hair, she decided to grant her fan his request. Hello, Aldrine2016 there. Since either Seanthehedgehog ou AnimeFan66 failed to write my part 2 request, I think this will be the first part 2 of an Aldrine2016 fanfic written par myself. After Dot returned to the tower, everyone looked at her, who was still in her and her brother's home, confused. Yakko: Well, she made us all laugh. It was morning at the Warner Bros. studios. Yakko, Wakko and Dot were still sleeping in their beds, until their alarm clock, which resembled Bugs Bunny, gave out a loud ringing and dinging. Yakko reached out his hand and, feeling for the clock, smashed it into pieces with his fist. Yakko: [yawns and gets up] Good morning, Wakko. Wakko: [yawns and gets up as well] Good morning, Yakko. At the PPG's house, Yakko, Wakko, Dot, Blossom, Bubbles, Buttercup and Professor Utonium were having mac and cheese for lunch. Blossom: [eating her mac and cheese] They a dit they got kicked par the park's statue for going crazy over it. Seriously, are they joking? Bubbles: [eating her mac and cheese] And then the evil Mojo Jojo melted the statue and announced to us that he is going to cause plus destruction, [begins to impersonate Mojo] because he is.... Mojo Jojo! The following was requested par Aldrine2016. The Animaniacs went back to the park with their new friends, The Powerpuff Girls. Yakko: Be careful with the statue though. It kicked us. Wakko: All because we a dit hello to it. Blossom: Well, it doesn't seem to be doing that anymore. A laser hit the statue, making it melt. Yakko: Uh, did one of toi three do that? Buttercup: Where did that come from? 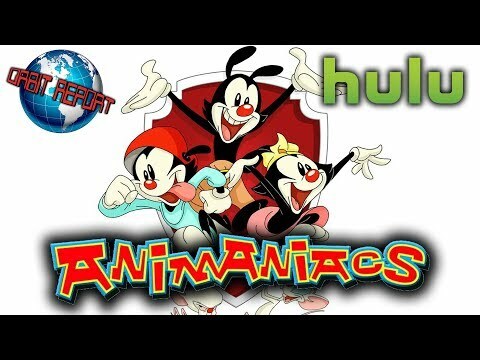 a video a été ajouté: Animaniacs - We Smashed Buddy! an answer was added to this question: What are the Warner's species? Answer To Animaniacs Is Cancelled!